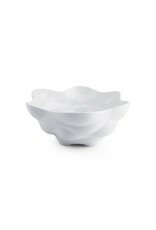 Carrol Boyes Carrol Boyes Ceramic Salad Bowl - wound up - Miam! Wound up range: Organic spirals undulate and bend, forming a range of multi-functional designs. The surfaces of these unpredictable curves reflect light in a unique way creating and illusion of movement.